Dance with Death. A beautiful masked woman takes to the floor with the dark lord. 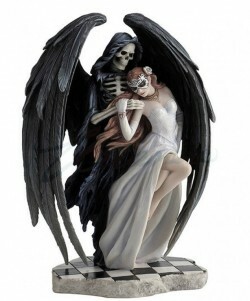 Stunning grim reaper artwork sculpture from the Anne Stokes collection. Excellent use of detail including marble flooring. Weighty and solid display piece. The reaper figurine arrives in an attractive box.